Coconut chutney Kerala style recipe or idli chutney recipe with coconut and mild spices is perfect as a simple and yummy side dish for for dosa(indian lentil pancakes) and idli (Indian steamed rice cakes). 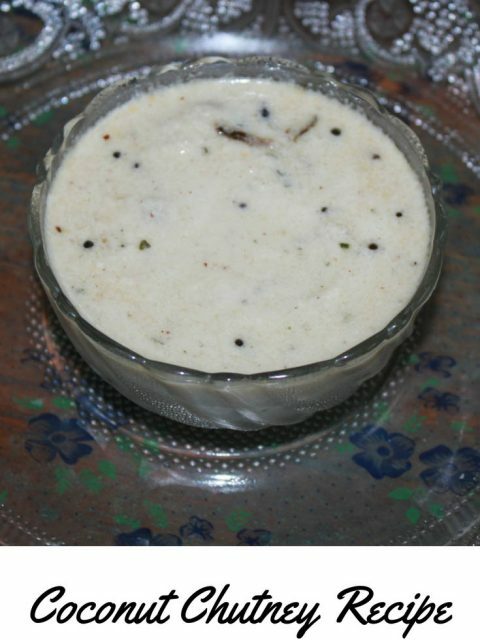 This type coconut chutney is very popular for South Indian style breakfasts. This coconut chutney is also served as a popular dip with South Indian snacks like uzhunnu vada (medu vada), parippu vada (masala vada) etc along with sambar. Coconut chutney recipe is also known as thenga chammanthi recipe in Kerala (or thengai chutney in other parts of South India) where thenga means coconut and chammanthi means chutney and nariyal chutney in North India (nariyal means coconut in hindi language). Coconuts are abundant in Kerala and you can find lots of Kerala style recipe with added fresh coconut in them. Coconut chutney is a very popular and traditional South Indian dish which can be made really easy, even with very few ingredients. Unlike many other South Indian chutney recipes, coconut chutney Kerala style recipe ingredients is mainly freshly grated coconut and mild spices, so you can prepare this very easily without being spicy at all. If you wish, you can make it spicy by adding more number of green or red chilies too. Here I am sharing the basic coconut chutney Kerala style which is the perfect dosa & idli chutney recipe, which you can easily follow. You can always alter the recipe and add more spices or other extra ingredients to suit your taste. If you don’t have fresh coconut at home, you can use unsweetened shredded coconut. I recommend using coconut oil to make this coconut chutney for the authentic and traditional taste, however you may also use oils like sunflower oil or sesame oil to make this coconut chutney. The mustard seeds we use for the seasoning are brown mustard seeds . Actually, there are many more ways you can make the chutney. I will also give you the most popular, optional ingredients you can add to the basic recipe that I share here. As I mentioned earlier, the basic coconut chutney Kerala style recipe or dosa idli chutney recipe is popular as a dip for South Indian breakfast items like dosa and idlis. That is the reason why it is more commonly known as dosa chutney or idli chutney recipe. This fresh coconut chutney goes very well with rava idlis too. So here is how you can easily prepare Kerala style coconut chutney using grated or shredded coconut and few other ingredients following this basic and easy recipe for coconut chutney. This is the basic, simple and popular coconut chutney recipe which makes a quick and yummy South Indian style side dish with dosa or idli. There are many variations you can find for this recipe as you can add many other ingredients to this basic coconut chutney to make it in different ways.The coconut chutney featured here is white coconut chutney, where we use green chilies to add spiciness. If you want to make red coconut chutney, replace the green chilies with dry red chilies (or use red chili powder). Blend together shredded coconut and water until the mixture is well blended. Add the green chilies, shallots, cashews (if using the cashews) and also curry leaves to the mixture and blend together for few more seconds. Heat the oil in a pan and add the mustard seeds. When the mustard seeds start spluttering(make sure to wait till the mustard seeds are spluttered otherwise it will taste bitter), add the chopped shallots and lightly fry until light golden brown in color. Add red chilies and curry leaves, fry for a few seconds. Add the blended coconut mixture to the pan, stir well and cook in low to medium heat for few moments. You do not have to boil the mixture, as boiling may change the taste and texture of the chutney. Just let the chutney get heated in the pan and you can remove it from the hot stove or switch off the stove just before it starts boiling. Coconut chutney is ready and you can serve it as a savory side dish or dip for anything you wish! For best results, serve the chutney hot. 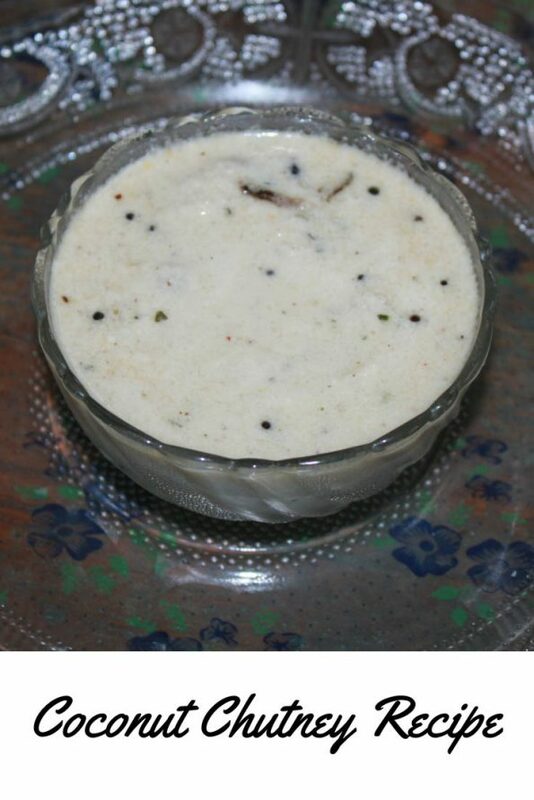 You can use the coconut chutney in room temperature also though hot chutney always tastes the best. I used few curry leaves for preparing the chutney and also seasoning. When you add curry leaves, make sure there is no water content in the leaves. you can serve it as a savory side dish or dip for anything you wish! If you are looking for coconut chutney that is more thick and sour which go very well with rice, you may avoid water and add a small amount of tamarind. Also try this dry ginger coconut chutney recipe which goes great with rice. Coconut chutney is a basic savory coconut dip which can be used as a side dish for many recipes, so you can try adding different flavors to the recipe and experiment yourself for new exotic tastes! Cashew nut is an optional ingredient but adding cashews make the chutney more delicious and creamy, so I would totally recommend using them! You can try adding 1 teaspoon of chopped garlic or ginger along with the ingredients and blend together for a different flavour. Channa dal(Bengal gram) or urad dal also can be added to the oil for seasoning, after the mustard seeds have spluttered. To add a slight red color to the chutney, add 1 or 2 red chili peppers to the ingredients and blend together. Or you can also add 1/4 teaspoon of red chili powder to the mixture.